Beach holidays are the perfect way to get a tan and the sun-kissed skin. Reading a book while lying on white sand beaches overlooking turquoise waters sounds like an ideal way to spend your vacation. The problem though is that most of the beaches in India are packed with tourists and locals, making your search for a tranquil beach a far away thought. The good news is I’m going to share with you a few secret beaches in India — totally secluded and hidden. You definitely have to visit these virgin beaches before they are flocked by tourists. When it comes to naturally romantic and exotic beaches, Lakshadweep is the mother of all, not only in India but also across the globe. Lakshadweep consists of 36 small beautiful islands, each stunning in its own way. Among all the scenic and isolated islands, Agatti Island is my favourite. Silver sands meet turquoise water — that’s the charm of this pristine island. Landing on the tiny strip of the airport runway is a thrilling experience for me. Every moment from touching down to leaving the island was jaw-dropping, especially because of the beauty of this place. And when you are on this island, do not miss out an unforgettable scuba diving experience! Ditch the typical tourist trail and head to the unexplored, exotic Secret Beach in God’s very own country, Kerala. Enjoy a walk on the white sand beach, completely isolated from the tourist crowd. Secret Beach is the perfect place to disconnect and reconnect with yourself. Listening to the water splashing against solid rocks and watching the tall palm tree gently swaying — this is indeed a heavenly experience. Very few people have been here or even heard of it. You can find this beach at Kattoor, 13 kilometres away from Alappuzha. Goa is a hot favourite among youngsters and revellers, and it is not easy to find a silent, peaceful beach in Goa. But a little bit of peace still does exist! Galgibaga Beach, close to Palolem Beach, makes for an exotic hideout beach destination in Goa. 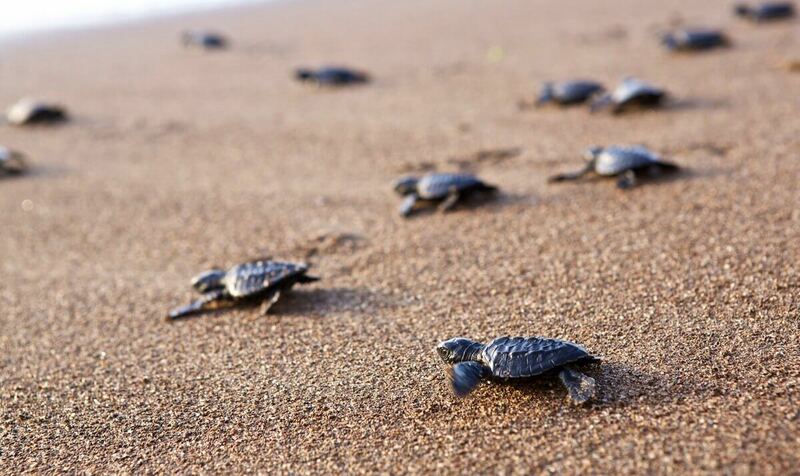 Even the endangered Olive Ridley turtles have made this quaint beach their abode on the north side of the beach while on the other end endless stretches of golden sand dotted with only a few beach shacks can be found here and there. Secret beaches have a mysterious appeal and walking into one such place is often many people’s dream. One such hideout is Butterfly Beach in Goa. Walk through the dense forests and be amazed to find a tiny beach cove which is home to white sand beaches lined with swaying palm trees, overlooking the sparkling Arabian Sea. Hidden to the north of Palolem Beach, this secret beach is easily missed, but now you better check it out before it gets swarmed by thrill-seeking travellers. Looks like a tiny spot in the Sea, this island is surrounded by clear Arabian Sea water. The best way to get to this island is by boat from Udupi, and you would not miss it for its shimmering golden sands from afar. There are plenty of steep standing basalt rocks around the island, rendering a unique yet mysterious look to the island. Once you’re on the island, you will find lots of crimson red crabs and shells along the coast. This place is undoubtedly one stunning piece of land around Malpe! Andaman & Nicobar Island has always been a secret haven for many. Although over the years their popularity has increased, a little bit of heaven remains virtually untouched. Radhanagar Beach, 12 km away from Havelock’s ferry pier, boasts pristine sand and blue waters. However, since being crowned as one of Asia’s best beaches by TIME Magazine, Radhanagar Beach may no longer be a secret beauty for all — so book your trip there fast! Located very close to the stunning Konark Temple — one of the UNESCO World Heritage Sites in India — is Ramchandi Beach. Unexplored and frequented by mostly local fishermen, this golden sand beach holds abundant beauty and charm. One can enjoy a relaxing time here indulging in some fishing, swimming or bathing in the sun with no one bothering you. As you walk along the shore, you will find tons of white shells between the fine grains of sand. If you’re looking for a piece of heaven on earth, this might be it. My suggestion is to escape the typical beaches and visit these tranquil paradise-like beaches while they are still untouched. I’m sure you won’t regret spending some quality time disconnecting from the hustle bustle of the city and reconnecting with yourself. Amrita is a full-time techie by day and a travel blogger by night. Her love and passion for travel have taken her to places.